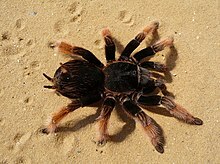 Brachypelma klaasi (also known as the Mexican pink tarantula) is a tarantula endemic to Mexico and it is the rarest of the genus Brachypelma. The setae of this species have a uniformly rusty appearance. The coloration is very similar to that of the six species of Brachypelma that are endemic to the west coast. B. boehmei is similar, having black tarsi, orange-yellow metatarsi, tibias and patellas, black femora and coxae and orange-yellow hairs on the opistosoma. It differs only in the carapace, which is yellow-orange in B. boehmei and black in B. klaasi. Another very similar species is B. baumgarteni. Adults of B. klaasi have a body length of about 6–7.5 cm with a 16 cm legspan. The species is named in honor of Peter Klaas, the collector of the species. B. klaasi is found at elevations of 300–1400 m above sea level on the western slopes of the Sierra Madre Occidental and some areas on the western limits of the Transverse Volcanic Belt in Jalisco and Nayarit states. Its known range extends from Tepic, Nayarit, in the north to Chamela, Jalisco, in the south, with the largest known population at the biological reserve at Chamela. There is a high rate of collection for the pet trade of B. klaasi and other members of the genus Brachypelma. As such, all members of Brachypelma have been placed on Appendix II of CITES. B. klaasi is considered to be the rarest and most threatened of the Mexican tarantula species. Their slow growth, combined with habitat degradation and illegal wild capture for the pet trade means that it is estimated that less than 0.1% of individual tarantulas survive from egg to adulthood in the wild. ^ a b "Taxon details Brachypelma klaasi (Schmidt & Krause, 1856)". World Spider Catalog. Natural History Museum Bern. Retrieved 2017-09-29. ^ "Brachypelma klaasi". Animal Diversity Web. University of Michigan. Retrieved 6 July 2015. Locht, A., M. Yáñez & I. Vãzquez (1999): Distribution and natural history of Mexican species of Brachypelma and Brachypelmides (Theraphosidae, Theraphosinae) with morphological evidence for their synonymy. The Journal of Arachnology 27: 196-200. Yáñez, M., et al. (1999): Courtship and Mating Behavior of Brachypelma klaasi (Aranea: Theraphosidae). The Journal of Arachnology 27: 165-170. Yáñez, M. & G. Floater (2000): Spatial distribution and habitat preferences of the endangered tarantula, Brachypelma klaasi (Aranea: Theraphosidae) in Mexico. Biodiversitiy and Conservation 9: 795-810. Striffler, B. & A. Graminske (2003): Brachypelma – die bunten Vogelspinnen Mexikos. DRACO 4(16): 52-61. West, R. C. (2005): The Brachypelma of Mexico. British Tarantula Society Journal 20(4): 108-119. West, R. C. (2006): Die Brachypelma-Arten aus Mexiko. ARACHNE 11(1): 4-17. Wikimedia Commons has media related to Brachypelma klaasi. This Theraphosidae-related article is a stub. You can help Wikipedia by expanding it. This page was last edited on 23 June 2018, at 22:01 (UTC).